It’s hard for a lot of people to imagine drinking coffee if it isn’t piping hot. Whether you are trying to keep your coffee palatable through your commute, or you are just old fashioned and can’t recognize coffee unless your tongue is scalded, you’re not alone. And we can sympathize- you feel the need, the need for degrees. 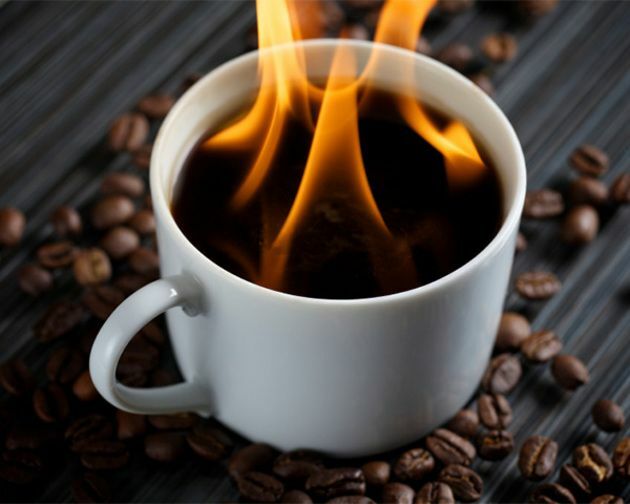 Before we talk tips on keeping coffee hot, let’s talk about why heat is a necessity in the first place. Hot coffee does have a pretty relaxing effect. First of all, it makes a great break from the work day while you do the balancing act of keeping your full cup away from your keyboard. When your drink is hot, you get the benefits of slow savored sips, warm mugs, steam carrying all those delicious smells directly to your sleepy brain. And a lot of people register steaming coffee as a sign that it’s been brewed fresh. Case closed. Hot coffee is good. It is possible to overdo it. 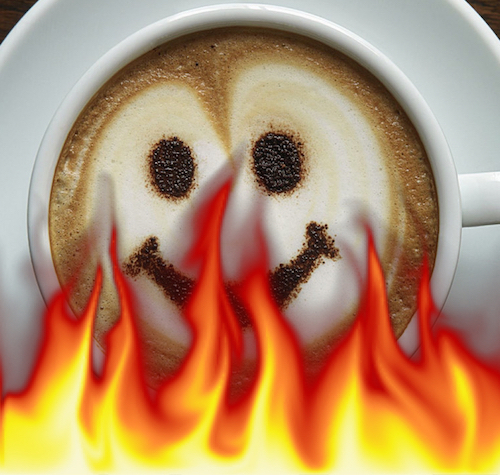 In people’s quest for hot coffee, one million degrees and no less, the beverage itself can be compromised and have a nasty taste that makes you wonder what you went to all the trouble for in the first place. Think of that cardboardy taste to your latte you ordered exxxxxtra hot, the sourness of coffee left on a warming burner all day, or the slimy film on milk that has been reheated in the microwave. A quick break down of the basic science of temperature and taste can help you avoid some of the pitfalls in the quest for hot coffee. Better yet, we’ll give you realistic ways to keep your coffee at the right temperature for longer – the best gadgets, tricks for when you brew, and suggestions for how to order your drink in a cafe. Brewing coffee is a big puzzle of variables, but for this discussion we will stay focused on temperature. There are cold-brewed coffees, but most brew methods involve introducing hot water to coffee grounds. When the hot water and coffee come into contact, the water dissolves loads of tiny particles called solubles. For coffee in particular, these particles include fibers, oils, sugars, amino acids, and minerals. Hot water between 195-205°F is ideal because it allows the maximum amount of good tasting solubles to dissolve in the shortest amount of time, which theoretically benefits a well rounded flavor and body in just a few minutes. Any colder and the coffee doesn’t have much natural sweetness because a lot of the soluble sugars don’t get extracted. Any hotter and the water not only dissolves more of the naturally occurring bitter solubles, but you essentially burn all of the good tasting particles. The most common way to heat milk in a cafe is with steam from commercial espresso machines that are engineered for consistency and allow baristas to control the process. Once the milk reaches 140°F the chemistry magic happens. As the milk gets heated and swirls in the pitcher, the carbohydrates break down into simple sugars that taste even sweeter. The proteins uncoil and bind with the air in the steam which gives the foam a velvety quality. The fats melt and get silky. Boom! Tasty latte! The problem arises when you heat the milk beyond 150°F when the melted fat starts to oxidize and you burn the sugars. The texture changes drastically because the proteins that were keeping those tiny air bubbles afloat just break down. Scorched milk tastes a bit of cardboard and the once velvety foam becomes bubbly and dry. If you are a do-it-yourselfer and heat milk on the stovetop or in a microwave, you encounter a whole different kind of gross when you get above that problematic point of 150°F. The milk becomes dehydrated when the heat causes steam to rise. The proteins and fats condense and create what is actually called, no lie, the milk skin. Stirring heated milk does help reintegrate the condensed compounds, but once it is scorched, the texture does remain a bit thick and you do lose the natural sweetness. When a liquid is hot, its molecules are bouncing around like crazy, which is the energy we experience as heat. To really loosely paraphrase Newton’s Law of Cooling, the universe is all about balance so that heat is naturally going to transfer to the objects and space around it that are cooler. It loses heat to the vessel it’s in, the environment around it, when the steam evaporates as a gas, and just because those molecules are slowing back down. The rate of cooling is also affected by the volume and mass, meaning that the more of something there is, the longer it takes to lose energy. Luckily we can manipulate certain factors to slow the rate of cooling. Whatever your ideal temperature is, it’s relatively easy to preserve it. So, the instinct in most cases is to just order or prepare your coffee drink exxxtra hot – but then you have to drink a bitter and flat cup of coffee. That kind of kills some of the joy you were hoping to capture. The idea is that you go against your instincts and prepare the coffee at an ideal temperature to bring out the best taste, around 205°F for a brewed coffee and 140°F for a milky drink. Then just be more clever about how you handle the coffee once it’s made to preserve that perfectly toasty temp. That’s where our tricks come in. To minimize the exposed surface area, make sure that your vessel is filled with more liquid than air. If you brew small batches of coffee into a pot, even if it is insulated, coffee will cool down so much faster because the lower volume and the excess air in the pot just snatches all the heat energy. Similarly for a travel mug, or for a traditional ceramic mug, the fuller it is the slower it cools. The more hot liquid you have in a tight space, the slower it will cool. Use a hot water rinse to preheat everything the coffee is going to touch to warm it before the coffee does. This includes the brew device itself, the decanter you’ll brew into, the mug you’ll serve it in. All of these surfaces retain heat, and once heat is established, it takes far longer to cool down. You can use the extra boiled water from your kettle or really hot water from the tap. Keep an inch of water in your mug or travel cup while you brew. Just remember to dump out your rinse water! You should also feel comfortable to ask a barista to preheat your personal vessel when ordering in a cafe. We know, they aren’t cheap. Insulated travel mugs are intended to maintain the temperature of liquids for long periods of time, and you will get what you pay for. That perfectly hot and tasty coffee will maintain its temperature for half of the work day! Think of the money you’ll spend on an insulated mug in terms of how many bad, scorched drinks you’ve paid for over the years. Also, tons of coffee shops give discounts for reusable mugs. And you have a built-in lid so you won’t ruin your work computer if it tips over. Score, and score. Double walled construction. A pocket of air retains heat incredibly well. Screw tight lid. Prevents spills as well as keeping in more heat (steam). If the lid has a drinking spout, make sure the seal is really tight and stable. Durability. Pick it up, tap it with your fingers, check to see if it feels heavy and durable. Don’t just look for a high price tag, trust your first instincts on build quality. Easy to clean. Not all travel mugs are dishwasher safe, but at the very least you are looking for easily removable parts and a mouth that is wide enough to fit a bottle brush into. Replaceable parts. Sometimes a lid breaks, or a body cracks. The most common part that could use occasional replacing is the silicone gasket (also called an “o-ring”), that a really great travel mug has built into the lid to create a tight seal. The gaskets can retain funky smells, so it’s ideal when you can remove them to do a deep clean or just replace them. 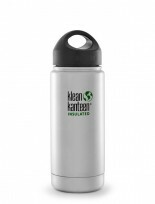 Check out one of our favorites: The Klean Kanteen. It is a bit pricier than some insulated travel mugs for the initial cost, but from our own experience with this brand over the years, we can’t imagine a circumstance in which you’d have a problem. If you are brewing your own coffee, transfer it to a thermal carafe as soon as it is done brewing. You won’t have to reheat your coffee when you are ready for a refill. It will be waiting for you in its cozy little nest. When looking for a carafe that will primarily just sit on a counter at work or in your kitchen, we recommend anything from the company Zojirushi. They make high quality equipment and are affordable. For a counter carafe, don’t get overwhelmed comparing endless reviews trying to find the perfect product. The main quality to look for is successful heat retention. All carafes are a bit goofy to clean, and delicate. 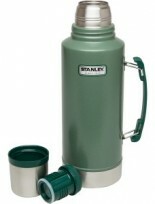 If you need a portable carafe, it’s hard to go wrong with products from Stanley. They have fairly competitive, quality products and tout a lifetime warrantee. 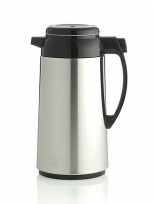 There is a huge range of thermoses in this style, from 16 oz to 2 QT, which is a LOT of coffee. We wouldn’t recommend hucking it down a mountainside or lugging it in your backpack next to your laptop, but for a relatively predictable commute or camping trip, this is a good one. Remember to preheat your carafe or thermos, and use the Goldilocks strategy of picking one that is just the right size. If you order a to-go drink from a shop without plastic stoppers, take an extra lid and stack it on top of your cup, but with the second lid’s sipping hole directly opposite where the original hole was. So if your original hole was facing you at 6 o’clock, stack the second lid so that the hole is at 12 o’clock. This keeps liquid from splashing out as you walk, and helps keep steam from escaping as quickly. PS. Watch this video from This vs. That, where basically every type of cup imaginable is tested for how long they keep coffee hot. Check out his rad explanation at 2:20 of how paper to-go cups and their cardboard sleeves work to insulate your drink. Best insulated beverage containers are Hydroflask from Bend, Oregon.